Lunch is always on my mind so I googled “Fair Trade Lunch” to find what Fair Traders offered. 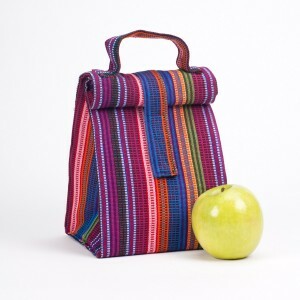 Other than Fair Trade USA’s Six Fair Trade Lunchbox Picks, the most relevant result was a Pinterest image of a lunch sack made from Guatemalan textile from Mayaworks. While it’s not available online, It’s available to re-sellers through special order. Jeannie Balanda sent this description: “Crafted with sturdy hand woven 100% cotton multi-striped fabric and lined with water resistant vinyl. It measures 9” tall by 6” wide with a 5” deep base. Roll-down top securely fastens with an adjustable Velcro closure to keep all your child’s goodies in place. This handmade lunch bag is adorned with a sturdy fabric handle for easy transport. 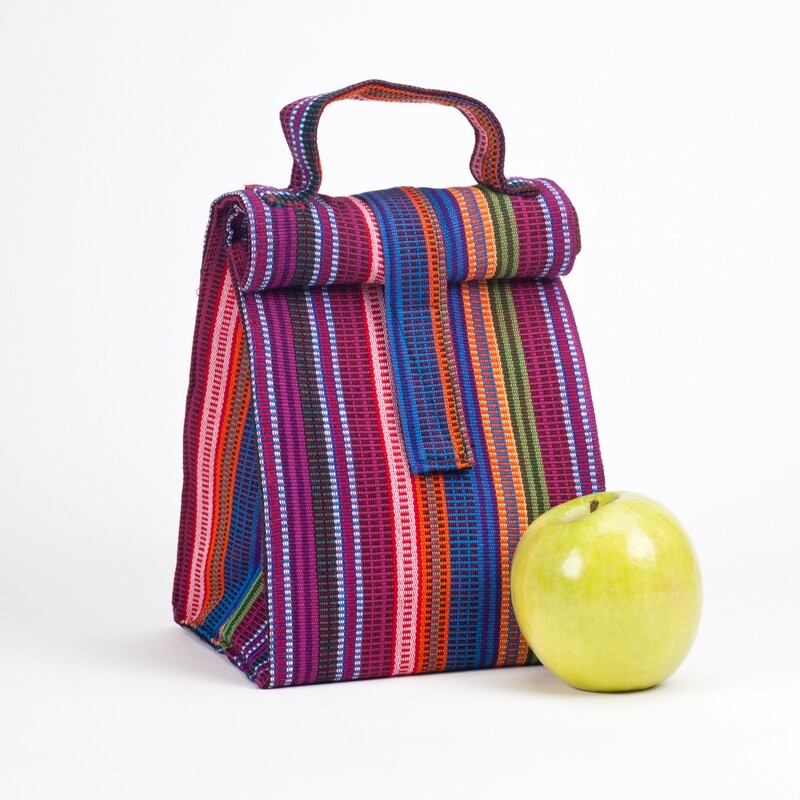 Not just for kids, adults will love carrying their lunch in this hand woven tote as well! Can be cold water hand washed and line dried. ” I think this could be a good replacement for my Flintstone lunchbox. 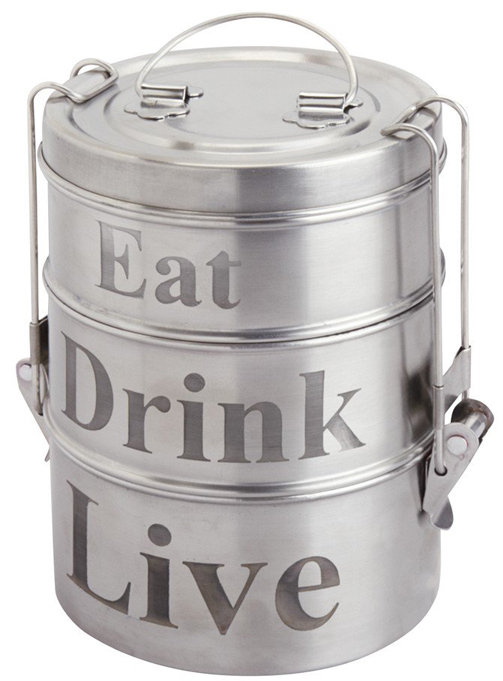 With lunch still on my mind, I found some unique fair trade items at Ten Thousand Villages that definitely fit my lunch-container bill. 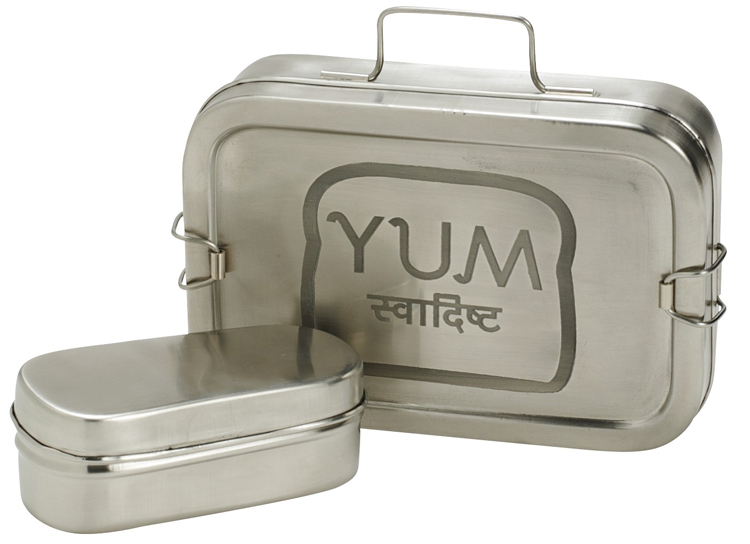 Villages carries the traditional Indian “tiffin”, the stacked round containers that are prevalent in the Indian workplace but would be great for students, and also carries a Sandwich Keeper that looks like a slimmed down version of my metal lunchbox. “[The tiffen boxes] have been one of our better selling items since 2010, but gained in popularity more so after the 2013 movie, “The Lunchbox” debuted, “says Jennifer, the store manager of the Villages store in Winter Park, FL. In Bangladesh and India, tiffin boxes are used to carry meals to school or work. In Mumbai, 200,000 tiffin boxes are collected from homes each day by “tiffin wallahs” who transport the boxes by bicycle and train to offices all over the city. The boxes are later picked up, cleaned and delivered back to the homes in time to pack the next day’s meal.” I’ve got to rent the movie! 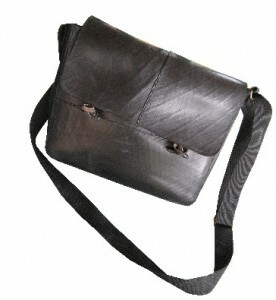 Fair Trade bags for carrying things to school and university are redefined this time of year. Clutches become pencil cases while messenger bags become book bags. Austin Zimmerman at Ganesh Himal Trading is particularly proud of the bags made of rubber from Nepal. “The wonderful thing about our rubber bags is that the common disposal method of tires in Nepal is burning. In response to black billowing clouds of smoke, one of producer groups offered to purchase numerous tires in hopes of improving air quality. From these tires came the first of Ganesh Himal Trading’s tire bags which today has developed into over 30 products! 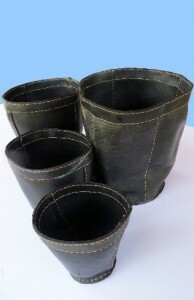 These products have been so popular over the years that in February of 2014, our producer partner, who we have worked with since the late 1980’s was asked by the project manager of Spinal Injury Rehabilitation Center (SIRC) in Banepa, Nepal to train 5 of their patients to sew the recycled rubber tire bags so that these patients could create a livelihood for themselves and support their families. Now almost all of Ganesh Himal’s recycled rubber tire bags are being hand stitched by paraplegic’s who have suffered spinal injury. ” These bags are water-resistant, making them the perfect book bag. Ganesh Himal Trading also offers a container made of rubber tires that makes a great dorm room waste basket. 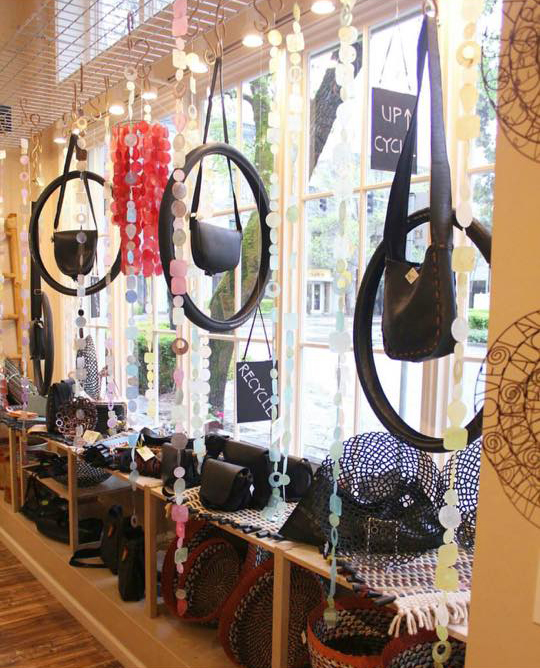 I know I’ve featured the Fair Trade Federation member retail store One World Fair Trade before (okay, three times) but I’m always jealous of how amazing their displays are! Here are the Ganesh Himal bags in the store’s window. And pencil cases? My favorite is the one made by BIO Imaginarte in Mexico from tires and pop tops. Okay, Global Crafts sells it as a clutch but it certainly is a perfect unisex pencil case. Am I brave enough to say that mine was a Donny Osmond lunch box?